If writing begins from staring into the abyss, then this book is a frozen record of that stare. If writing is to hold a memory of that stare, then this book is haunted by it. And if the writer who stared and recorded the dense silence out of which words emerged, is alert to the shivering quality of those words, she will treat them as fragile relics of her encounter, and watch them as they erode. Here is a book made of words that do not express, comment, create: but receive, rest, quiver, quieten, fade. Of words like the characters and the spaces outlined by them: remote, sparse, subtly cruel, unlikely. Any time they meet—the words and the characters, in every sentence—they appear as ghosts or shadows of each other, partly similar, partly drowned in forgetfulness. They form a sequence of tableaux which does not grow or develop but curls into itself, drawing the attention to the tiniest ripples on the surface of perception through ambiguity, sparseness and brevity. This book was written by a woman who once said that writing is a little story of decay. From Marcel Schwob, whose Vies imaginaires (Imaginary Lives) she translated from French to Italian in 1972, she learned of writing as a distorted and mystifying echo of an echo of an echo, leaving enough blanks and missing points for the writer to fill in with the arabesques of artifice. From Thomas De Quincey, whose Last Days of Immanuel Kant she translated from English to Italian in 1983, she learned of the slow relentless transitions from sublime to rot. And from Ingeborg Bachmann, her best friend, she received the best possible summary of her writing: ‘a mixture of distracted lightness and authoritative wisdom.’ This book is dedicated to Ingeborg. 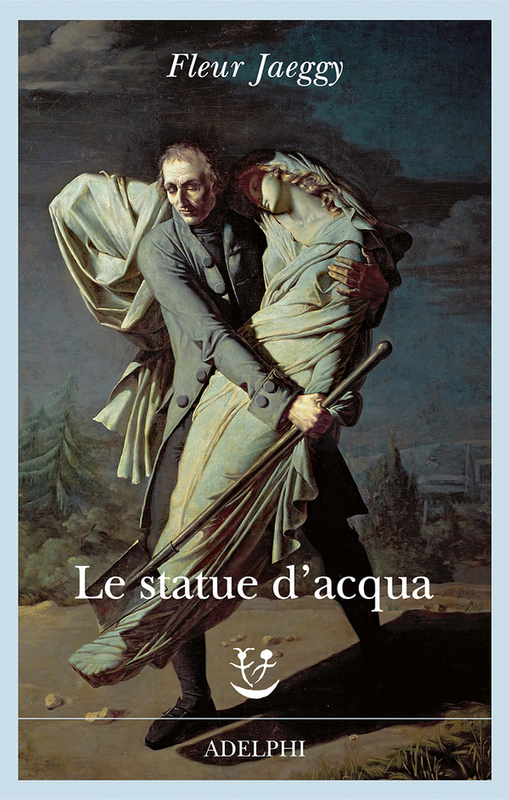 Reprinted last year in Italy by Adelphi Edizioni, thirty-five years after it was first published in 1980 and not yet translated in English, Le statue d’acqua (The Water Statues) is one of Swiss-Italian writer Fleur Jaeggy’s earliest and most mysterious books, one that tempts me to say she didn’t write it as much as she divined it from within an unstable territory of dreams and visions: moving, not moving, staying still, waiting for signals, intercepting the smallest vibrations. Beeklam lives in a basement in Amsterdam with his collection of water statues, and talks to them. Can you imagine their conversations, or better perhaps, his collection of twisted monologues? He is ‘one of those who were born lost, and began from their end’. The water statues, whose nature is as unlikely and vivid as in a dream, could equally be reflections or disembodied voices or ventriloquist’s dummies or ghosts. In my reading, they belong to the same family of unreal yet poignant objects of desire as Michel Leiris’s ‘trumpet-drum’ or ‘postcard phonograph record’, as examples of a language stretching into the unnameable. Like in a fairytale, Beeklam the child is ‘laden with years’: the time of childhood and the time of old age are the same in him, so young and yet speaking as if he’s experienced all of Time’s duration. In a circularity of non-events, of premonitions and déjà vu, like a child he sees and seeks the world, like a very old man he meditates on it and remembers that there’s no innocence. ‘The vocation of remembrance: something brutal and celestial.’ He attends to the ephemeral: memories, shadows, running water. His statues are made of water too, or maybe they are reflections from the past and constantly reshaped by his memories. Sometimes he goes out at night, he watches, listens, never reaches out, enwrapped in muteness. Halfway through the book Beeklam’s female double appears—Katrin, whom he encounters or perhaps dreams of one day, in a pavilion near a cliff ‘where the calm claws of leaves would bestow shadow, substance and disorder’, a site of the dead and of ghosts: Böcklin-esque in its ashen slate tones, as suggested by Roberto Calasso in the book blurb. No clear plot binds these pages together: different scenes, and characters always vaguely familiar and always somehow transformed, emerge in and out of large washes of blank spaces: hushed polyphony of impure tones out of a silence dense with otherness. There is not much to follow, and a lot to contemplate. Iosif Brodsky remarked that Jaeggy’s writing might not take long to read but its memory lasts forever: this sense of weighted reverberance holds The Water Statues together, its pages as sites where nothing takes place but the sound of a ceaseless dissolution, shaken intermittently by sharp fits of laughter: the convulsive laughter of eternal characters bound and submitted to time. —How do you invent a story? —I do not invent it. I stay there for hours in front of the typewriter. It’s a little story of decay. I look inside of me. I look outside of me. And there is nothing. For months there is nothing. Sometimes for years. —What do you do then? —Work of resistance and abandon. —What do you resist or abandon yourself to? —Resistance is the result of discipline. Use of techniques. To create or to be subjected to frictions towards a goal. Which one? To survive, to float, to protect oneself. And when resistance gives up, abandon takes over. It’s like swimming. Armstrokes in the water. Efforts. Goals to reach. You delude yourself that you can devour the sea, resist it. And when you no longer have any strength you abandon yourself to it. … My typewriter is my ally. Its swamp green colour reassures me. Its name is Hermes. The Water Statues is the book of Hermes-the-trickster, Hermes-the-messenger, Hermes-the-conductor-of-souls-into-afterlife, Hermes-of-mysteries, Hermes-the-god-of-transition. The porous blank portions between the words in The Water Statues soak up Jaeggy’s discomfortable writing. They enfold the space of space, or to quote William H. Gass writing of Rilke’s Innerweltraum, ‘the space made by Being’s breathing … Not just the space we call consciousness, but the space where we retire in order to avoid a feeling… These spaces are always palpable, as though space were smoke, or the mountains of the heart where the last hamlet of feeling may be discerned.’ The blank spaces host echoes, ‘speech where speech ends’, the voices of ancestors. Jaeggy herself has acknowledged, in discussing herself hearing writing in between German and Italian, that German is to her the voice of dreams: the voice of Beeklam who dreams to live as if drowned, of Katrin who dreams of the place where she lives to be taken elsewhere. Their voices might be written in Italian, but not Italian by the book: this is Italian by the dreams, its mutilated syntax and structure bearing all the weight of its writer’s traffics with German and English, bending, twisting, stretching the limits of what is correct, linear, accepted. As I try to read the uneven forms of Beeklam’s and Katrin’s lichen-words out loud, they make me out of breath or compel me to fast-paced inhalations that fracture the line of the sentences: better then to hear them. I did not feel at that time the puritan inclination to make a tale out of a harmless vision, but looking at the magpie there was in its way of lingering, of keeping still, a sort of stubborn wait, as if it was following a thought of its own, nearly spiritual I’d say, as it if was about to tell me something, perhaps to think of water—or follow it, I could not tell, I tried to understand by looking at it in the eyes, but the magpie’s eyes turned elsewhere, they opposed my glance with two minuscule velvet slits … I would then follow, almost not realising it, that dull grey and clumsy tangle that cautiously moved toward the cliff … It was as if the magpie could smell the long gone ships, saw the stars and the shadows, not understanding how far they were. It barely smiled, as if it felt some sort of dark and circumspect joy in seeing me similar to it, in having copied my appearance. James Hillman has written at length of those instants when some unpredicted and uncannily familiar presence brushes against us: call it daimon, the sly wink that prompts reflection, call it necessity or in this case, the categorical prompt to write. Jaeggy often mentions a similar quick motion, that she attaches to the German term Übersprung: the barely perceptible movement of a cat when it diverts the attention and hesitates before it strikes its prey. ‘Mechanics of precision. To look elsewhere, to move on to something else, to show the gesture of detachment, like a farewell.’ Or: De Quincey’s ‘dark frenzy of horror’. It happens to Beeklam and Katrin throughout the book: they embody a succession of states, in spasms and flickers of necessary yet inexplicable insights among distractions, farewells, false starts, words and visions that remain inconclusive. ‘The meandering off a theme, the escape from a word and at once the hunt for words, their dismissal: they are all mental manners of writing,’ Jaeggy has said. The Water Statues’ uneven forms, dead ends and dead characters, detours and interruptions mirror a writing disposition where the drive to put words on paper is countered by stillness, the compulsion to tell becomes convulsion of form, plans are sabotaged, blanks take over. It follows a rhythm which is often broken; it stutters sidelined suspicions. Devious, it delays any timeline and expands on the incidents: never to seek fulfilment, but to spin in stubborn loops around a void that may deny itself to its characters, but refuses to be silenced. Fleur Jaeggy (1940– ) is a writer and translator. She was born in Zurich, Switzerland and lives in Milan, Italy. She is the author of novels and short stories. Sweet Days Of Discipline, Last Vanities and S.S. Proleterka have been translated into English by Tim Parks and Alastair McEwen, and published by New Directions. Her books in Italian are published by Adelphi. Posted in Book reviews and tagged Fleur Jaeggy, The Water Statues, untranslated. Bookmark the permalink.